They're here! 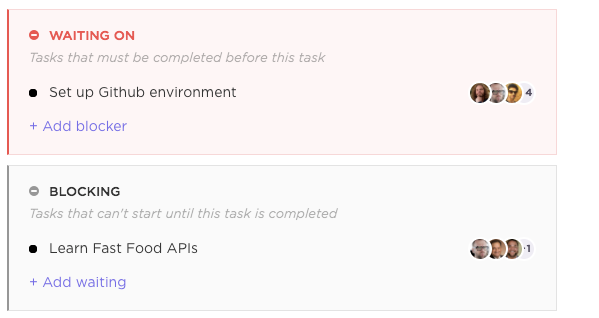 With dependencies, tasks you can make tasks either WAITING ON or BLOCKING other tasks. You'll receive notifications when tasks are ready to be worked on. You're going to LOVE this one! We're one step closer to bringing your entire productivity process into ClickUp. Now you can create and organize your own personal notes, directly inside of ClickUp. Spaces are now found in the menu bar at all times in ClickUp for easy access. OH and did we mention... the icon GROWS when you have more content, so you can tell how much content is in the task simply by looking at the icon. [NEW] Checklist icons will now show when you have checklist items assigned to yourself. [NEW] In Me view, you can now filter and find tasks that have checklist items assigned to you.